Edgewood. Ia. (1949)— William (Buffalo Bill) Cody’s colorful past attracted straight shooting, hard riding men, but prospects of traveling with the famous westerner faded when an Iowan felt the call of the soil. The Iowa youth was Allen Hansel. now of Edgewood, who recently celebrated his 90th birthday. An adventure in the West, where he met and rode with Buffalo Bill, failed to lure Allen Hansel away from Iowa during his youth. He returned after an exciting four months in the wild and woolly West. Hansel. a youth of 20, was traveling with a wagon train through Lincoln, Nebr. Stepping into a saloon to observe Buffalo Bill, the young Iowan was invited to join the crowd in a drink with the famous buffalo hunter. At first, he declined, saying that he did not drink. But friends persuaded him to take a glass of beer. He encountered Buffalo Bill later, and was invited to the westerner’s ranch. Since it was on the trail, Hansel and friends made an overnight stop at the ranch. His host invited Hansel to try his luck on a bucking horse, and the Iowan rode the bronco to standstill. He was then invited to a shooting match, and outshot Cody, who was one of the deadliest shots in the west. After two more days of riding and shooting, Buffalo Bill insisted that Hansel remain. He was organizing his famous wild west show that toured Europe and America. Hansel, Cody, and another man rode into Wyoming. But the Iowan soon tired of visiting saloons with the buffalo shooter, and rode on down to Kansas, after promising he would meet Cody in Overland. That was the story recalled by Hansel, who is alert and active in spite of his years. Hansel was in the West less than five months, but managed to pack a lifetime of excitement into that brief adventure. He recalled punching cattle in Kansas when that country was populated by men who delighted in putting daylight through anyone who disagreed with them. He became acquainted with Indians, and engaged in horse racing with them. On one occasion, he recalled, Hansel was surprised to learn that he had won an Indian princess by merely winning a horse race. Feeling no romantic inclination toward the chief’s daughter, Hansel said he ended the visit by galloping at breakneck speed toward his own camp, a distance of 10 miles. But. he added, his prize package showed up at the cow camp a few days later. After feeding the princess he escorted her toward the Indian camp, and again departed at a full gallop. From that day until he left the West, Hansel avoided Indians. When he began to ride herd for a cattle owner in western Kansas, Hansel said, he was informed by the owner that a job vacancy would exist as soon as he (Hansel) caused a Mexican rider’s job to end —by the simple procedure of causing an end to the Mexican’s life. Hansel refused. He was informed that the Mexican felt that he, too, must create a vacancy by bringing a halt to Hansel’s breathing. The problem was solved by two other riders who went for a ride with the Mexican who never returned. Life was too cheap; soil was too poor in the wild and wooly west. Hansel and two other Clayton countians, Andy Gaylor and Tip Bedow, pulled stakes and returned to the rich soil of Iowa. 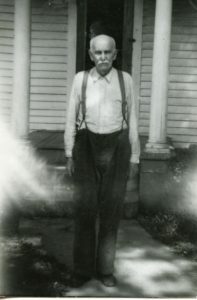 Taylor (sic) engaged in several enterprises in Edgewood, which included farming and real estate business. For two years he was a land agent in Texas. He made money and lost money, but managed to save enough for retirement. After returning to Iowa he (Hansel) married Emma Smith, and raised three boys and four girls. Several years after his western adventure Hansel again met Buffalo Bill whose show stopped for an engagement in Dubuque. Hansel learned that Cody was delayed in his trip to Overland. Had Cody arrived in time to meet the hard riding, straight shooting Iowan, Hansel might have sought his fortune in show business. Perhaps Hansel could have joined the show after it was organized. But the peace and security to be found in farm country lured him back to Iowa. The subject of this article is Allen M. Hansel (1859-1953) of Edgewood, whose descendants are well-known in the area. Story originally published in the Dubuque Telegraph-Herald in 1949.